Beginning of the End! The homepage countdown has hit 00:00:00 - launching The March of the Shadowscythe! The End of the Universe??!!?? Queenadent Odessa has TWO brand-new missions for you at the War Camp - complete with NEW music, NEW enemies, and NEW cutscenes! GEAR UP! Check out the Head and Shoulder shops in the War Camp & Soluna City for a new Exclusive Limited-Time Set. Valoth's Epic Destruction Head & Shoulder work together to create combos vs. those nasty Shadowscythe enemies! 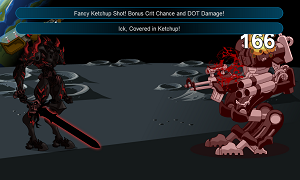 Cover your enemies with ketchup with this new seasonal rare front shoulder weapon by Plasma Charge! Screenshot courtesy of Blade. Stay tuned for lots more exciting news ahead - and Battle on!